First things first. The Aroma 5500 is not an espresso-cappuccino machine designed for home use. Even if you’re a true power coffee drinker, this is simply more coffee machine than you’d ever need at home, unless you’re entertaining 30+ guests on a daily basis. Having said that, there might be a few people who would want one for home use anyway, and if you do, then you’ll be hard pressed to find a better, more all-encompassing, feature rich coffee/espresso/cappuccino machine than this one. This machine is really designed for business/office use, but since it represents a significant outlay of money, we wanted to review it carefully here so you can make an informed purchase decision. Aroma 5500: Super-Automatic Espresso Machine. Let’s start with the basics then. 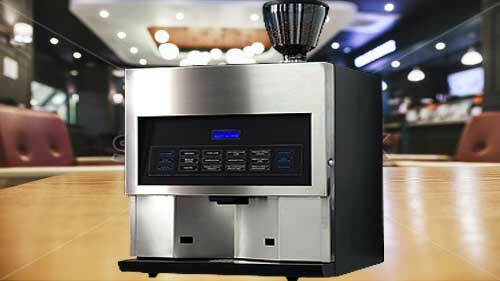 The Aroma 5500 Super-Automatic Commercial Espresso-Cappuccino Machine retails at a whopping $7495.00. It’s not exactly a small device, either, with dimensions of 24”x20”x31”, and weighing in at a hefty 95 pounds, this is a serious piece of coffee making machinery. The system has no need for a separate water reservoir because it ties directly into your existing water system. Thus, it draws water on demand straight from your office’s current plumbing system with no modifications or re-plumbing required. You can literally just connect it and start making coffee. 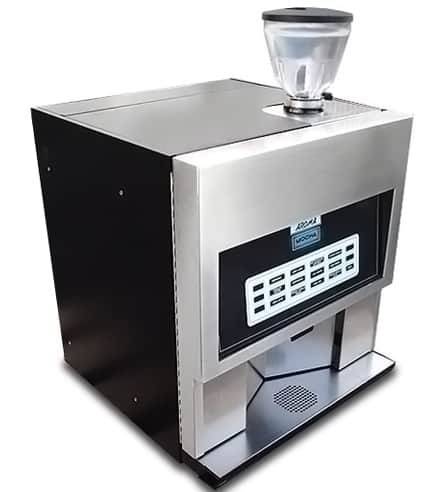 Of course, if you don’t want to connect the Aroma 5500 to your existing water line, you can simply acquire an independent reservoir and brew that way, but you absolutely don’t have to use a reservoir at all. The heart of the system, though, is the onboard computer. You can control every aspect of your coffee programmatically, from brew strength to water/ground ratio, the amount of froth, and even the precise temperature of the coffee. Best of all, once you’ve got it set up the way you want it, anyone can use it at the touch of a button. There are a couple of quite interesting features about the Aroma 5500 that aren’t readily apparent but are absolutely worth talking about. The other big thing to note here is the fact that the machine has a built-in grinder. The problem with buying ground coffee is that it begins to lose the fullness of its flavor from the moment the beans are ground. Most people get around this by grinding their own, one pound at a time, but of course, this too is an imperfect solution for the exact same reason. No, the very best way to ensure an aromatic, full-flavored cup of coffee is to grind the beans cup by cup, as you need them. This is exactly what the Aroma 5500 does. 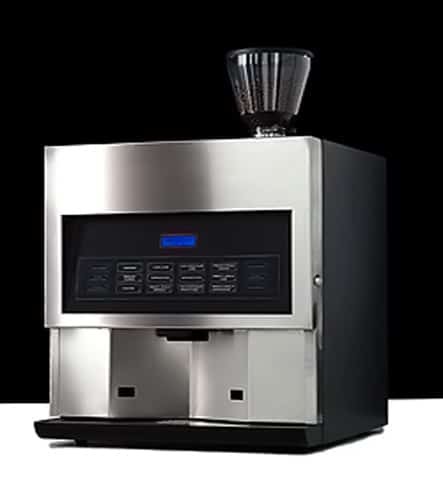 The onboard grinder has multiple grind settings, so you’ll not only be able to deliver a whole range of hot coffee drinks, but you’ll have a high degree of control over the body of the finished product. That’s amazing, and it leads directly to the creation of simply exquisite coffee, cup after cup. The machine’s onboard computer does more than simply dispense drinks at the touch of a button though, it’s also got a built-in tracking system, so you can track how much of each type of drink you’re actually dispensing. So you can better plan your bean and ingredient purchases, using the real time data as a guide, and if you follow the simple end of day recommended maintenance routine, you’ll get years of faithful, worry-free service from the coffee machine. Again, this is not for everyone. 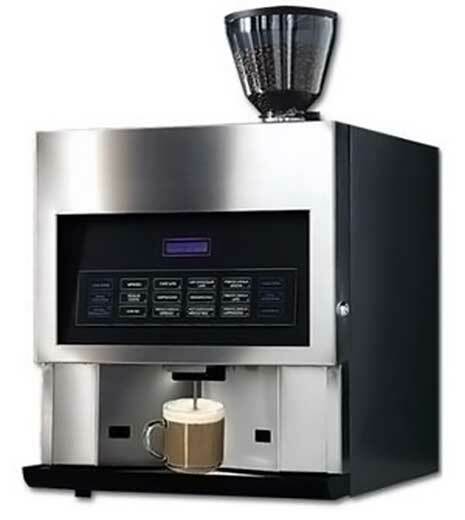 The aroma 5500 super-automatic commercial espresso-cappuccino machine is overwhelmingly used in business, kiosks, coffee carts, convention halls, and places that see quite a lot of foot traffic. It can handle crowds of any size, but you’ll want to see a minimum daily traffic of 30+ people in order to get the best use out of it. An all-around great machine that we cannot recommend highly enough. See more of the Aroma Super-Automatic Espresso Machine... Click here.